Despite low in situ primary productivity, tropical oligotrophic rivers support highly diverse fish assemblages and productive fisheries. This raises the question, what energy sources support fish production in these ecosystems? We sampled fish and food resources in the floodplain of a nearly pristine, large, oligotrophic river in western Amazonia. We combined data from stomach contents and stable isotopes to test the hypothesis that floodplain forests sustain fisheries in tropical oligotrophic rivers. Analysis of stomach contents from > 800 specimens of 12 omnivorous fish species demonstrated that during the annual flood, forest plant matter dominated diets. Yet, our isotope mixing models estimated that arthropods from the forest canopy made a greater proportional contribution to fish biomass. Most of these arthropods are entirely terrestrial and, therefore, serve as trophic links between forests and fishes. Our results suggest that forest vegetation, particularly fruits, may provide much of the energy supporting metabolism and arthropods contribute significant amounts of protein for somatic growth. 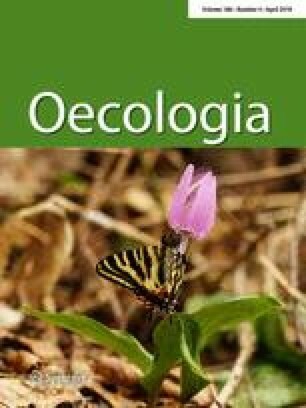 Moreover, the importance of terrestrial arthropods in support of fish biomass in oligotrophic rivers depends on interactions between riparian vegetation, terrestrial arthropods and flood pulse dynamics affecting accessibility of arthropods to fishes. The apparent paradox of high fish diversity in an oligotrophic river with low primary productivity may be explained, at least partially, by dynamic terrestrial–aquatic trophic linkages. This study further emphasizes the importance of seasonally flooded forests for sustaining fisheries in the Amazon. The online version of this article ( https://doi.org/10.1007/s00442-018-4093-7) contains supplementary material, which is available to authorized users. We thank field assistants (J. J. Patarroyo, L. Cruz, I. López, L. Bravo, E. Tanimuka, J. J. Acevedo, B. Mejía, L. Tanimuka, A. Carevilla, and F. Yucuna) and colleagues in Colombia who provided logistic support and access to laboratory facilities (Francis and Edwin Palacios, Conservación Internacional; Santiago Duque, Universidad Nacional de Colombia, Sede Leticia; and Pablo Stevenson, Universidad de los Andes). This research was funded by the Wildlife Conservation Society’s Research Fellowship Program (to SBC) and the estate of Carolyn Wierichs Kelso. We thank indigenous leaders of the Resguardo Yaigojé-Apaporis (Puerto Ňumi and Bocas de Taraira) for granting access to their territories. Research permit was granted by the Instituto Colombiano de Agricultura, Colombia. All applicable institutional and/or national guidelines for the care and use of animals were followed. SBC and KW designed the study. SBC collected data and conducted analyses. SBC and KW wrote the manuscript. The data used in this publication will be archived at the Dryad Digital Repository.